A key requirement when it comes to printing variable information such as bar codes, shelf labels, shipping labels, prescription pharmaceutical labels, or any type of label that requires longevity, is that it must be a quick, simple process. There are three elements that contribute to printing a good quality label: the printer, the label substrate and the thermal transfer ribbon. The latter often gets the blame when the printed label is sub-standard, says Marco Buthelezi, Plant Supervisor at Kemtek Imaging Solutions. "However, the problem could equally have been caused by the printer itself or the label substrate used." Some of the more common issues that arise that are blamed on the ribbon include poor image quality or the ribbon snapping during printing. "Both of these occurrences can just as easily be caused by applying the incorrect printer settings," says Buthelezi. "Oftentimes, ribbon-related issues are caused when the ribbon is damaged before it's even installed into the printer; it's also possible that the label substrate is incompatible with the grade of ribbon used. The ribbon may be incorrectly loaded into the printer or the width of the ribbon may to be narrow for the printed image. There are myriad reasons for problems arising, very few of which are the actual ribbon's fault." Buthelezi is in charge of the thermal transfer ribbon slitting plant at Kemtek, so is well positioned to comment on the role of the ribbons in the printing process. He explains how the plant operates: "Spools of thermal transfer ribbons are converted into many different widths and lengths to meet the requirements of the various label printers available on the market." Thermal transfer ribbons come in scratchproof, smearproof, solvent-resistant and heat-resistant format for a wide array of industrial printing applications. However, not all thermal transfer ribbons are created equal, and Buthelezi explains where the differentiators lie. "Firstly, it's important to understand that not all thermal transfer ribbons are the same, even though they do the same fundamental job. They differ in terms of the various substrates that they have to print on. There are also assorted industry standards that they have to comply with." He goes on to clarify the different types of thermal transfer ribbons and their various applications. "So, for instance, black wax thermal transfer ribbons are generally used for standard printing on paper, whereas black wax-resin thermal transfer ribbons provide excellent resistance to chemicals on paper and synthetics. Resin thermal transfer ribbons provide durability against chemicals and heat on synthetic substrates." * Choose the correct type and grade of thermal transfer ribbon for the substrate to be printed on. * Choose the right width of thermal transfer ribbon for the required label. 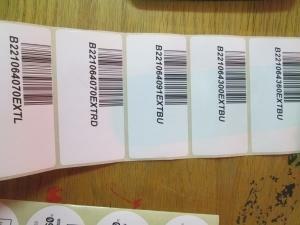 * Ensure the thermal transfer ribbon of choice is compatible with your label printer. Kemtek's ribbon slitting plant provides top-rated quality materials across South Africa with the broadest range of options in relation to standard and specialised thermal transfer ribbon coatings, addressing almost 100% of the South African and sub-Saharan African requirements .